The knight rider light bar circuit creates a running light similar to the light bar on the car from the television show Knight Rider. It’s a really fun circuit to build. I once built a larger version of this for the inside of a party-bus I was a part of. Unfortunately I broke it the first day because I increased the voltage too much, but that’s another story. You can build this circuit if you’re a total beginner, but of course it’s a bit easier if you have already built a few circuits before. To create the knight rider light bar, you need to build two parts; an oscillator and a counter. You can find these components at one of the many online electronics shops. The counter is built using the 4017 Decade Counter chip. 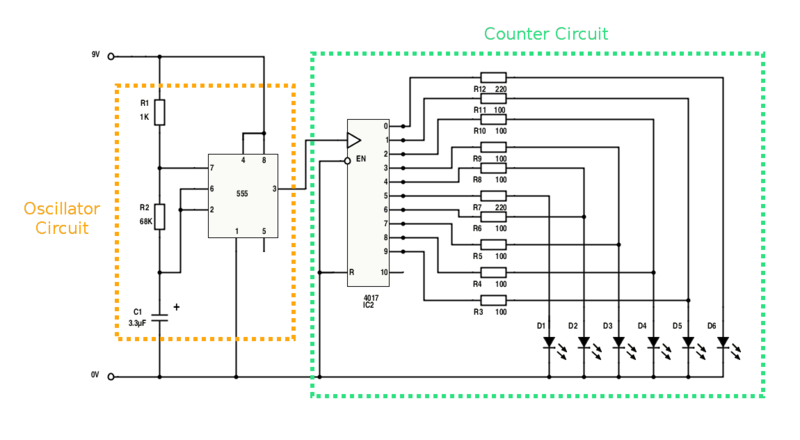 The counter sets one of its 10 outputs high depending on where in the counting sequence it is. So if it’s at 0, output 0 will be high. If it’s at 5, output 5 will be high. And if we have an LED connected to the output, the LED will light up. 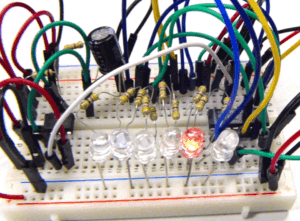 There are only 6 LEDs, but 10 counter outputs. Each of the LEDs on the two sides connect to output 0 and output 9 as shown in the knight rider circuit diagram above. The rest of the outputs each connect to two LEDs. This gives us a light that looks like it’s running back and forth. The counter starts at 0 and increases every time it gets a pulse on its counter input. The oscillator is built around the 555 Timer chip. This is the part that creates the pulses for the counter input. The speed of the oscillator (i.e. how many pulses it has per second) determines how fast the light will run back and forth. The resistors R1, R2 and the capacitor C1 sets the frequency of the oscillator. The frequency equals the number of pulses per second. How To Build The Knight Rider Light Bar With LEDs? 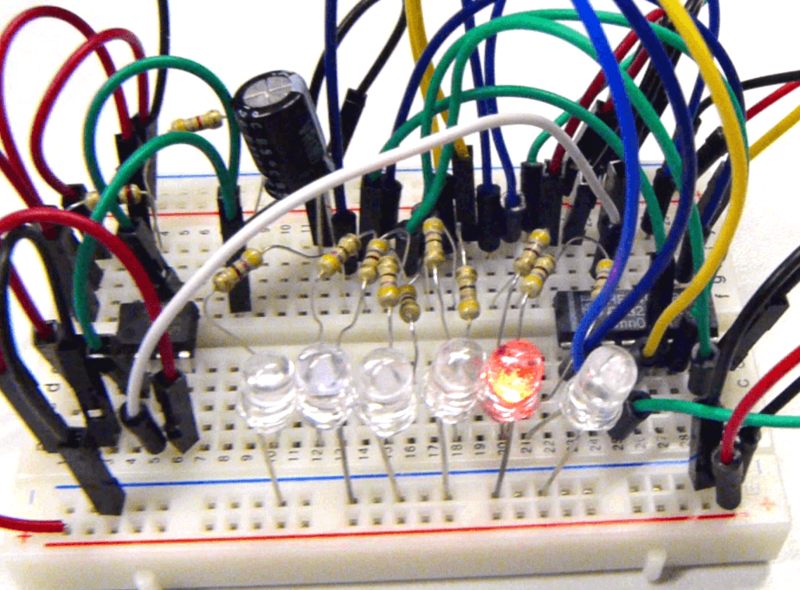 The circuit can easily be built on a breadboard or on a prototyping board for soldering. I usually like to build the circuit on a breadboard first. Just to make sure I understand it and am able to build it before soldering it onto a prototyping board. Once the circuit is soldered, it’s a little bit harder to make changes if you messed something up. (But not too hard though, you can always desolder). Start by connecting the oscillator part. 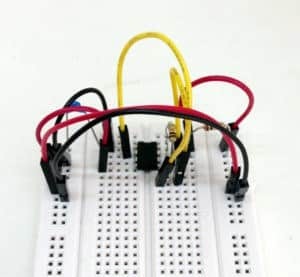 Connect it at the top of your breadboard so that you’ll have lots of space to connect the rest of the circuit below. Then test the 555 timer oscillator by connecting an LED in series with a resistor on the output. With the values chosen above, your LED should blink about 3 times per second. Make sure you get this to work before you move on to the next step. Also make sure you remove the LED and the resistor before you continue. Now that you know your oscillator is working, you can connect the remaining parts. Connecting it as shown in the knight rider light bar circuit diagram shown above. What If The Circuit Doesn’t Work? If you followed my steps above, you know that your oscillator circuit is working. So something must be wrong with the counter circuit or in the connection from the oscillator to the counter. Start by checking that the connection between them is correct. If no LEDs are lighting up, there’s a big chance that you’ve connected your LEDs in the wrong direction or that you are using the wrong value for the resistors. Check the direction of your LEDs and check that the resistors are 100 Ohm. Only one LED should light up at a time. If more LEDs light up at the same time, you must have a faulty connection from the outputs of the counter to the LEDs. Inspect the ones that light up at the same time carefully to find the error. Post your comment below if you tried to build this, and let me know how it went! Brilliant! How would I add more lights? Let’s say a 20 led squence though? The first thing that comes to mind is some setup with shift registers. But I don’t have a design for it at the moment. I see that you used voltage divider, am I right? Just want to ask when to use voltage divider and current divider. Could you please provide samples. You’re right that R1 and R2 would make up a voltage divider yes. But in this case that’s more of a coincidence than a conscious design choice.. I think shift registers would be the easiest and most flexible way to add more LEDs. A shift register you say. Hmmmmm. I accept your challenge and will respond with my results. Thank you for your reply AND the idea. Can a potentiometer be added to change the speed the LEDs light??? Yes, you can replace R2 with a 100k potentiometer for example.